Sun Lu Ban can use any piece of equipment as Wine. Once per turn, Sun Lu Ban can give any other character a diamond-suited card and choose a third character within their attacking range. The first player must attack the target selected by Sun Lu Ban. If they do not, Sun Lu Ban can take one of their cards and put it in her hand or deal one unit of damage to them. Note that Sun Lu Ban can use equipment cards in her hand or in her equipped area as Wine when she activates "Lechery." The diamond-suited card that Sun Lu Ban give to another character when she activates "Slander" can come from her hand or from her equipment area. The 'third character' that Sun Lu Ban selects when she activates "Slander" cannot be Sun Lu Ban. If the targeted character cannot reach anybody in their attacking range when she targets them with "Slander," this part of the ability is skipped and Sun Lu Ban then chooses to either acquire one of their hand cards or cause one unit of damage to them. "Lechery" is quite useful when Sun Lu Ban has several pieces of equipment. Since she can use each one as a Wine, one could consider each of them to be an extra unit of health. Additionally, there are many situations in which it is worth it to discard a piece of equipment to increase the strength of an Attack. "Slander" is versatile. Sun Lu Ban can use it on an ally (if she knows that they have an Attack) to give them a card and allow them to attack an enemy, not entirely unlike Chen Gong's "Brilliant Scheme." She can also use in on an ally to activate with a damage-activated ability (like Cao Pi's "Exile" or Xun Yu's "Eternal Loyalty"). However, it is most useful against enemies. She can give an enemy a diamond-suited card and force them to attack one of their allies. If they do not, Sun Lu Ban can either damage them or take one of their cards, neither of which is an attractive option for the poor target. Both of Sun Lu Ban's abilities are very powerful in their own respects, but the fact that these two abilities work so well together cannot be understated. Sun Lu Ban can use "Slander" on an enemy. If they do not play an Attack on Sun Lu Ban's chosen target, she can acquire one of their pieces of equipment for the use of "Lechery" at a later time. Sun Lu Ban has very few options for helping an ally that is low on health. Her only defensive ability ("Lechery") allows her to play Wine more frequently, but this is not helpful for dying teammates. Her only other recourse is to try to kill the other enemies before they kill her teammate. Mismanagement of "Lechery" can cause Sun Lu Ban to find herself in hot water. Equipment is very important both for extending Sun Lu Ban's attack range and for keeping her protected from enemies. If she uses "Lechery" to power up an Attack that is escaped, she will have wasted a precious piece of equipment for nothing. This is not a problem for careful players, but reckless ones will have trouble. When an enemy is targeted by "Slander," they can avoid the most painful effects of the ability by playing an Attack card. Keep in mind that Attacks are the most plentiful cards in the deck. While it is never fun to attack an ally, it is an easy way out of avoiding suffering damage or losing equipment. Guo Jia/Xun Yu/Cao Pi/God Cao Cao - These characters have useful damage-activated abilities. Sun Lu Ban can use "Slander" to damage them and activate their abilities. This is particularly useful when Sun Lu Ban gives them a diamond-suited Peach to allow them to activate their abilities without a net lose in health. Liu Bei/Chen Gong/Cao Hong/Zhang Zhao & Zhang Hong - These characters can help Sun Lu Ban by giving her equipment to use to activate "Lechery." 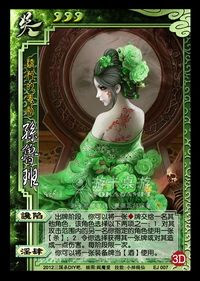 Da Qiao - Sun Lu Ban can give Da Qiao diamond suited cards via "Slander" to help her activate "Country Scene." For this reason, they are good allies. However, if they are enemies and Sun Lu Ban uses "Slander" to damage her, Da Qiao can easily retaliate by Capturing Sun Lu Ban with her newly-acquired diamond-suited card. Zhang He/Wu Guo Tai - These characters can help Sun Lu Ban by siphoning equipment from other characters and giving them to her, but they can also use their abilities to remove her equipment, so they can be good allies or formidable enemies. Ling Tong/New Ling Tong/Sun Shang Xiang - These characters have abilities that activate when the lose equipment from their equipment area. Sun Lu Ban can expedite this process by using "Slander" to remove their equipment. This makes them useful allies, but it also gives them a degree of leverage against her if they are her enemies. It is fair to mention that she can always cause damage to them instead of taking equipment, but foregoing the opportunity to acquire equipment may leave her at a disadvantage later in the game with she is low on health. Gan Ning/Jiang Wei/Deng Ai - These characters specialize in card destruction. They can use their abilities to remove her equipment, robbing her of the ability to use "Lechery" when she is low on health. King Sun Lu Ban is a good king choice. She can use her abilities to acquire one of each type of equipment from each of her enemies. Then, she can begin to use "Slander" to damage her rebels. Loyalist Sun Lu Ban is a serviceable loyalist choice. Her abilities are very good for fighting rebels, but she has no abilities to help the king stay alive when they are close to dying. Rebel Sun Lu Ban is a good rebel choice. Again, she can easily acquire equipment to gain a large amount of vitality. "Slander" is useful against the king. Spy Sun Lu Ban is also a competent spy. "Slander" can turn the tides rather quickly. However, it is important to keep the king healthy, as she will have difficulty keeping him/her alive if they are close to dying. Sun Lu Ban is the standout character of the unofficial 3D DIY expansion. While we wrote three weaknesses in her 'Strengths and Weaknesses' section, these are all minor complaints. She is borderline overpowered. When using her, be careful when using "Lechery" to power up an Attack. You should only use this ability when you are very confident that the Attack will land. Also, keep in mind that there are many possibilities for the outcome of "Slander." Use it on an enemy whom you are confident does not have an Attack card in order to maximize its usefulness.